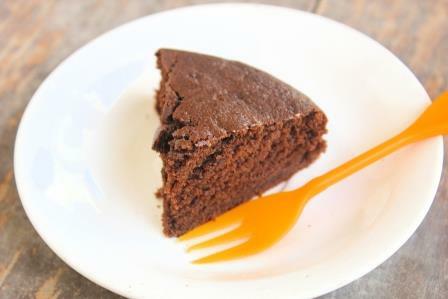 Eggless dark chocolate cake recipe: 1 bowl, moist dark chocolate cake recipe from scratch. 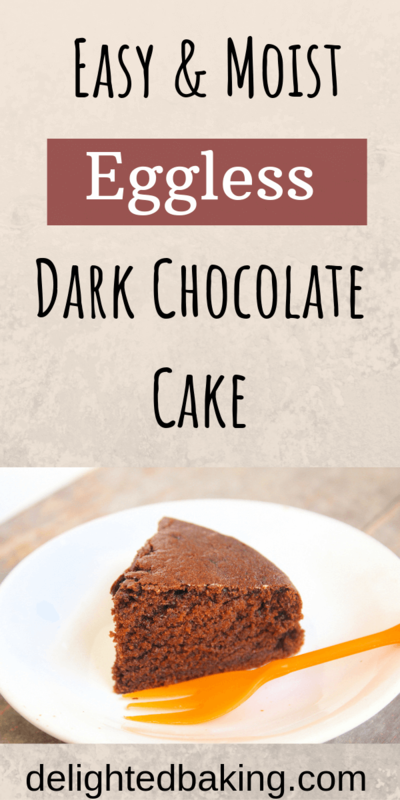 This egg-free dark Chocolate cake recipe is perfect for you if you are a fan of eggless chocolate desserts! Chocolate desserts are loved by one and all, especially kids. And whether you are celebrating birthdays or any other celebration, chocolate cake is one of the most demanded desserts. So, if you are looking for chocolate desserts for your next celebration, do give this recipe a try. 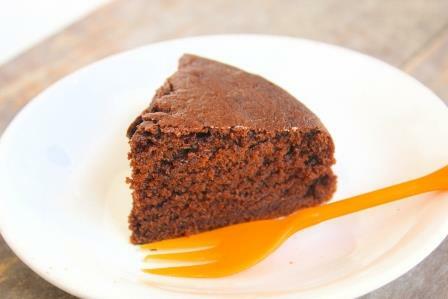 Eggless dark chocolate cake uses melted dark chocolate along with cocoa powder. Melted dark chocolate gives this cake a unique taste which is different from the regular chocolate cakes. The best thing is that this is a one bowl recipe. A one-bowl cake recipe is one in which you need only one mixing bowl and one spatula or hand whisk. You don’t need any other utensils for preparing such cakes. Therefore such cakes are easy to make and can be prepared quickly. This dark chocolate cake is also a one bowl cake recipe. This is a simple dark chocolate cake recipe without using eggs. Therefore if you are vegetarian or you are allergic to eggs, you can easily try this recipe. Yogurt is used as an egg substitute in this eggless cake recipe. Yogurt provides moisture and makes this cake soft. The cake is so soft and moist that no one would be able to tell that this is an egg free cake. 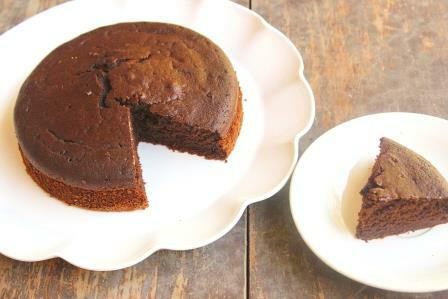 How to make eggless dark chocolate cake? Firstly we will melt dark chocolate and butter for this cake. You can either melt chocolate and butter in the microwave or use the double method on the gas stove. Allow the dark chocolate and butter mixture to cool down completely. This is an important step so don’t avoid it. Now take the cooldown melted dark chocolate ( & butter) mixture in a mixing bowl and add sugar and yoghurt. Beat with the help of a hand whisk for 1 minute. In a separate small bowl add instant coffee powder (CLICK HERE TO BUY INSTANT COFFEE POWDER ONLINE) and hot water. Give it a quick stir and add it to the main mixing bowl. Now put a sieve on the mixing bowl and add the dry ingredients (all-purpose flour, cocoa powder, and baking powder). Mix nicely till you get a smooth cake batter. Add the cake batter into a greased cake tin and bake for 35 to 40 minutes at 180-degree centigrade in a preheated oven. 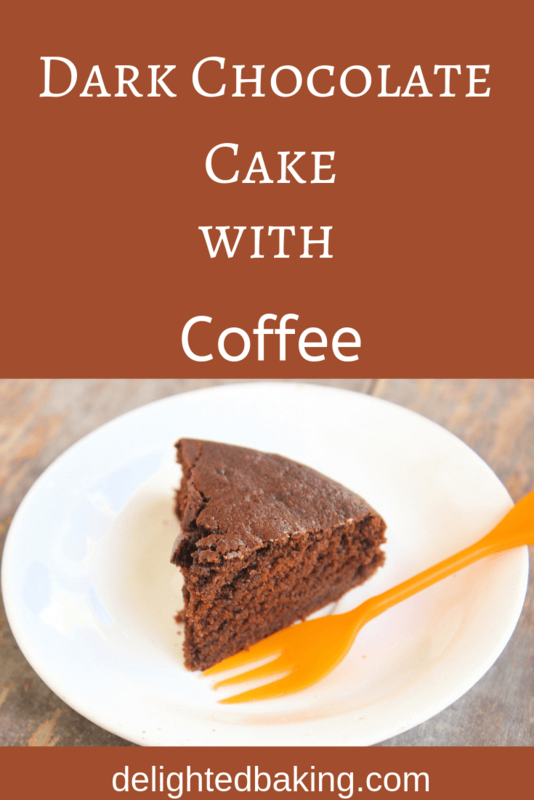 Coffee enhances the flavour of cocoa powder in a chocolate cake recipe. You won’t get the taste of coffee in the final cake. Coffee is used in many chocolate desserts (especially chocolate cakes) for adding complexity to the chocolaty flavor, resulting in a richer cake, cookie or brownie. Do try this easy chocolate cake recipe. This cake is perfect for small get-togethers, birthdays and anniversaries party. You can also bake it as a special dessert for any day regular lunch or dinner. Surprise your family with this homemade eggless dark chocolate cake. Do try this recipe and if you have any doubts regarding the recipe feel free to ask them in the comments below. One bowl, moist dark chocolate cake recipe from scratch. If you are a fan of eggless chocolate desserts, then this is a must try recipe for you! In a separate small bowl add instant coffee powder and hot water. Give it a quick stir and add it to the main mixing bowl. Mix nice little you get a smooth cake batter. Homemade eggless dark chocolate cake is ready! If you want to make this cake healthier, use whole wheat flour (atta) in place of all-purpose flour (maida). Use the exact amount of whole wheat flour. You might need to add 2-3 extra tablespoon of milk. You can skip adding coffee (if you want to). Although you won't get the taste of coffee in the final cake. If the cake batter is too thick, you can add 2-3 tablespoons milk. As this a dark chocolate cake, this cake is less sweet. If you want to make this cake sweeter, add 2-3 more tablespoons of sugar. You can also decorate this cake. Use this recipe as the base cake (Double this recipe to make 2 six inch cakes) and decorate the cake with chocolate ganache or whipped cream frosting. 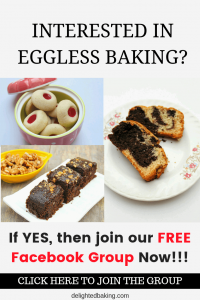 STAY CONNECTED : Join our FREE Eggless Baking Facebook Group Today!!!! How much is cup measurements 240/250 ml? Hi. 250 ml is approximately 1 cup. you dont use baking soda…is it fine? As generally i saw both baking powder and baking soda to bake cakes. Please reply. Hi. Yes. It’s completely fine. Both baking powder and baking soda are leavening agents (that is they help the cake batter in rising). Now it depends upon the ingredients used in the recipe whether you should use only baking powder, or only baking soda or both. In this recipe, baking powder only is capable of rising the cake batter properly.